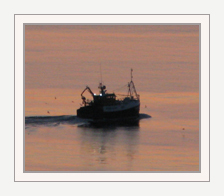 Mallaig & North-West Fishermen’s Association Limited (MNWFA) was founded in 1947 “to allow fishermen of Mallaig and the North West Coast to make contact with other fishermen and Fisheries Boards and to have a voice in the affairs of the industry”. (Extract from the original Minute recorded at the formation of the Association). At that time membership was comprised almost entirely of local herring boats. With the subsequent demise in the 1970s of the West Coast herring fishery, boats in the 40-60 foot size range turned to prawn and whitefish trawling. The Association has a small full time administration team and is run by elected Directors. MNWFA Property Ltd: In addition, the Association has a property company, which administers the commercial aspects of the Association’s work, namely our fishermen’s net stores. The Personnel and Roller doors of the stores were recently replaced with funding assistance from the European Maritime and Fisheries Fund (EMFF ) and the Scottish Government. MNWFA was a founder member of the Scottish Fishermen’s Federation (the political side of the industry) and some Association members are also in membership of the Scottish Fishermen’s Organisation (the marketing side of the industry), which was also partly funded by MNWFA. Through these bodies we influence – as best we can- fishing policies, licensing etc relevant to our area. Several of the members are also in the West of Scotland Fish Producers’ Organisation, of which MNWFA were the instigators. We are responsible for the political, commercial and pastoral interests of our members, on whose behalf we negotiate at local, national, and international levels. We run a small pension scheme which distributes money at Christmas time to pensioners who were once Association members. We also have a small vessel loan scheme through which we offer interest-free loans to young skippers, who have previously been in membership of the Association for four years, when purchasing their first vessel. We also offer interest free loans for re-engining. We operate a bursary for members who are attending college and attempting to obtain mate/skippers tickets etc. This arrangement also extends to engineering courses and Open Learning courses. We also administer a Fishermen’s Protection Plan (Group Life Insurance) scheme for all members who wish to participate.